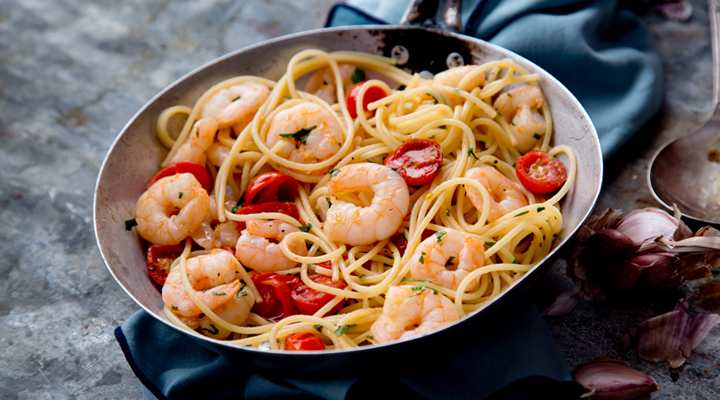 A fun family pasta dish. 1. Cook the pasta in a large pot of boiling salted water according to the packet instructions, until it’s al dente. Drain and set aside. 2. Heat the oil in a large frying pan set over a medium heat. Add the prawns and garlic and cook for 2 to 3 minutes. Add the halved cherry tomatoes, basil and vinegar and the drained, cooked spaghetti. Season with a pinch of salt and pepper and mix everything together well. 3. Transfer to a large serving bowl and grate over some Parmesan. Set the bowl in the centre of the table and let everyone help themselves. Now all you need is some crusty bread and good company.